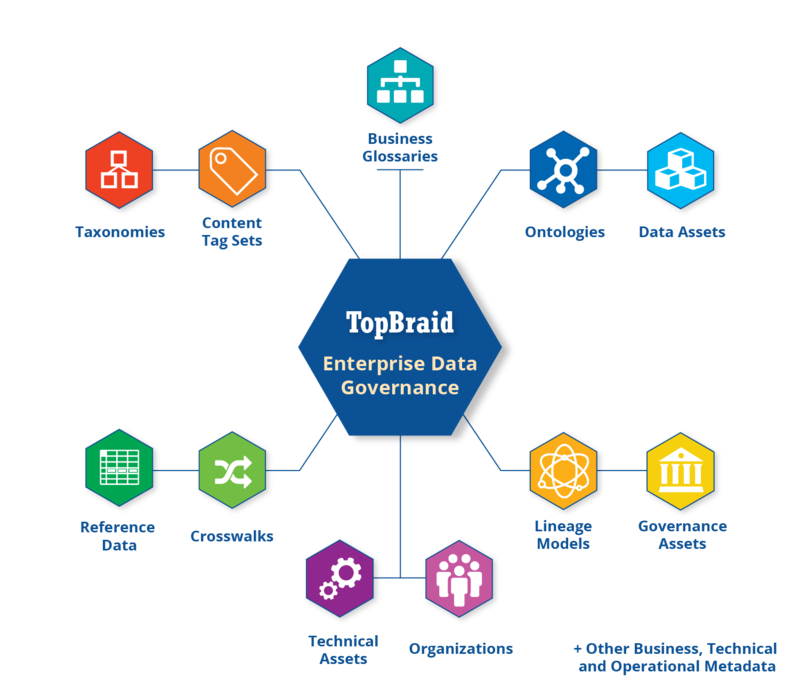 Using standards-based knowledge graph technologies, TopBraid EDG supports integrated data governance across numbers and types of data assets and governance needs – because connections are important. With EDG, you can choose data governance packages to support a comprehensive and staged approach to data governance. We recognize that in ramping up a data governance program, different organizations may have differing priorities and starting points. With TopBraid EDG, you can start incrementally. For example, you may start using EDG for just business glossaries or just reference data or you may first focus on metadata management. After the initial start, you can always extend your scope to governing other assets when you are ready to do so. To support this comprehensive but staged approach, TopBraid EDG provides focused packages, available as an initial configuration of EDG. Further, several add-on modules are available to extend the use of TopBraid EDG even more. How Can TopBraid EDG Help? By connecting all kinds of data and its metadata, semantic data management systems empower users, data stewards and analysts to make more accurate use of, gain precise and timely insights from, and unlock the true meaning behind their business’s data. TopBraid EDG facilitates data governance while reducing IT burden. It offers data curators and stewards a robust collection of easy to use governance tools and provides all data stakeholders Google-like access to connected information about all data, its meaning and context. Learn how with TopBraid EDG, organizations are now finally able to connect their silos of data and metadata, and unlock the true meaning behind their business’ data. Watch how TopBraid EDG can track lineage for an individual data value on the FR Y-9C to the data elements it is derived from – by just following the connections. Watch our video to learn more about how TopBraid EDG provides the flexibility and extensibility needed for complete enterprise data governance. This webinar recording shows how TopBraid EDG enables a comprehensive but incremental approach to collaborative data governance. Learn how the TopBraid EDG Vocabulary Management package combined with available add-ons enables semantic search of published documents from different sites. In this short paper, we outline key knowledge graph characteristics, and how they meaningfully bridge enterprise metadata silos. Review Frequently Asked Questions and Answers about how TopBraid EDG can improve your enterprise data governance. Explore documentation for users, and administrators while learning more about the TopBraid suite of products.